CollectPlus is a convenient and easy service especially for those who are busy and not at home to receive a parcel. We have three main services, Click & Collect, Returns and Send. We partner with over 90 online retailers to offer Click & Collect to a CollectPlus store near to where you live, work or study. Choose the CollectPlus option in checkout and you will receive a notification code via text message or email when your order has arrived. Our Click & Collect partners. If what you have ordered online doesn’t suit we partner with over 350 retailers to make returns really easy. Often you will find a returns label in the parcel that your delivery arrived in or you can download a label from our Returns page here..
With our Send service you can send a parcel to someone at either their home address or to a CollectPlus store of their choice. Simply buy a label here and print at home or if you don’t own a printer print in store for a small fee. 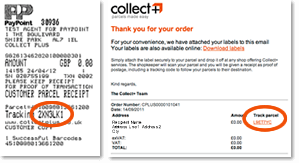 After dropping off your parcel at a CollectPlus point, keep the receipt the store keeper will give you when your parcel is scanned in and you can track the parcel using the tracking reference (it will usually be a mix of 7 letters and numbers) displayed two thirds the way down the receipt, as in the example here. Or download the CollectPlus App to store all your parcel details in one place.